A rock with carvings dating back at least 4,000 years has been uncovered in Pickering. The stone is originally from Ravenscar but became part of a barrow or burial mound on the North York Moors. During the mid 19th century it was brought to Pickering by a local collector Thomas Kendal and displayed in the town. 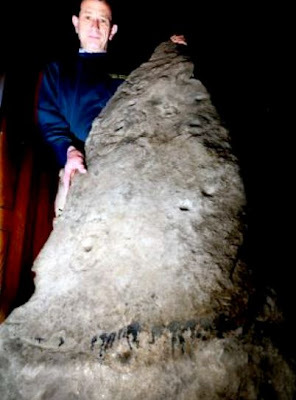 It has now been uncovered in a garden and will shortly go on display at Whitby Museum. Archaeologist Alan Walker, from Malton, said the symbols on the stone dated back to the early Bronze Age although it may be significantly older. “It is extremely exciting. The stone is of national importance and will be put on permanent display as part of a project in the North York Moors National Park,” he said.